Helping students develop considerable skills of configuring equipment for operation with OSPF dynamic routing protocol and setting up a network with several zones. The lab is performed using GNS3 emulator. It is expected that the student is already acquainted with the corresponding theoretical material, which is not explained in this lab. In order to brush up on the theoretical material, one should use textbooks on Cisco CCNP Route. Redraw the network scheme of 0 zone shown on the image at the end of the lab to the blackboard or your notebook. Allocate IP addresses to all necessary interfaces and decide what loopback interfaces are to be used on which routers and what for. Use 3640 and 7200 series routers to build the scheme of 0 zone in GNS3. Perform the preliminary configuration. Switch on the OSPF routing process on all routers included in backbone zone so that all internal interfaces fall within 0 zone. One can ask the instructor to provide them with the necessary commands or browse for them in the Internet. Make sure that all adjacencies are established and the exchange of prefixes has been carried out successfully. Examine the contents of the OSPF topology table and find out what LSAs it has. Find out which routers carry out DR and BDR functions in the network segment with SW1 switch. Add the standard type 1 zone to the actual scheme. Specify the IP addressing in the new zone on the scheme. Add routers to the virtual network in GNS3 for building the 1 zone. Configure OSPF in zone 1. Examine topology tables of routers in zone 0 and zone 1. Carefully examine topology tables of border routers (ABR). Puzzle out which LSAs are used for transfer of certain messages. Shutdown any interface in zone 1. Use debug command as well as Wireshark utility that is built in GNS3 in order to examine the exchange of OSPF messages in zone 1 and zone 0. Switch the interface back on. Add zones 2 and 3 and assign IP addresses to them. Add new routers to the virtual network in GNS3 in order to establish zone 2 and zone 3, which will be considered as stub and totally stub, correspondingly. Perform all necessary configuration procedures of routers in zones 2 and 3 as well as ABR. 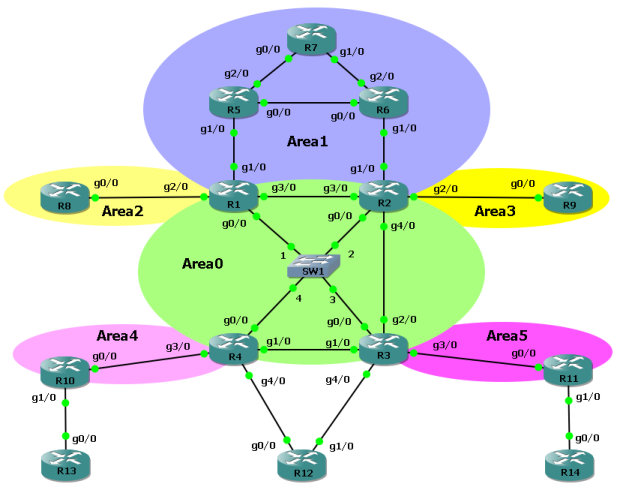 Examine topology tables of routers in zones 2 and 3. Connect another router (specified as R12 on the scheme), supporting the other dynamic routing protocol (for example EIGRP), to certain routers (specified as R3 and R4 on the scheme). Perform redistribution of routes from EIGRP to OSPF. Examine topology tables of routers in various zones straight after that. Which LSAs are used for transfer of the redistributed routes? Add zones 4 and 5 to the scheme and assign the IP addresses to them where necessary. These zones must be of the following types: NSSA and Totally NSSA. Connect other routers that use different dynamic protocols to the routers of the newly created zones. Perform the redistribution of routes to OSPF. Examine topology tables of routes with regard to the above mentioned. *Perform the route filtering on ABR and ASBR routers. Make sure that the filtering has been performed successfully. *Configure authentication between any two routers. Tasks marked with asterisks are not obligatory. Download the PDF file with the description of the lab.